4 LC DBM About the Cover: An outdoor kitchen and dining area, a custom trellis, a spa with rain gardens, and fire features were all part of an Irvine, Calif., residential project led by Yvonne English from Legends in Landscape. 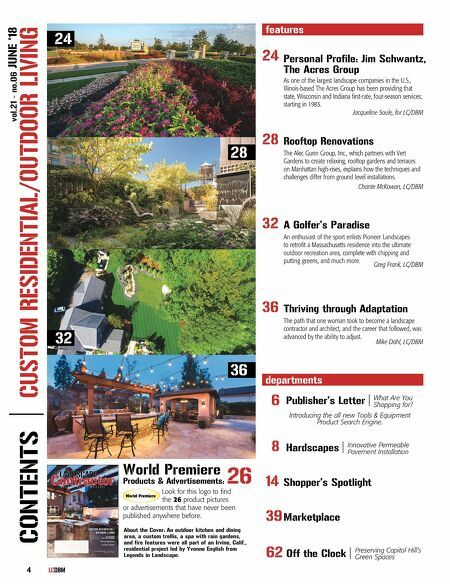 CUSTOM RESIDENTIAL/ OUTDOOR LIVING ON THE COVER ADAP TING TO CHANGE ROOF TOP RENOVATIONS A GOLFER'S PAR ADISE F i n d 2 6 W o r l d P r e m i e r e s I n T h i s I s s u e J U N E 2 0 1 8 v o l . 2 1 - n o . 0 6 departments features As one of the largest landscape companies in the U.S., Illinois-based The Acres Group has been providing that state, Wisconsin and Indiana first-rate, four-season services; starting in 1983. Jacqueline Soule, for LC/DBM Personal Profile: Jim Schwantz, The Acres Group 24 The Alec Gunn Group, Inc., which partners with Vert Gardens to create relaxing, rooftop gardens and terraces on Manhattan high-rises, explains how the techniques and challenges differ from ground level installations. Chante McKowan, LC/DBM Rooftop Renovations 28 An enthusiast of the sport enlists Pioneer Landscapes to retrofit a Massachusetts residence into the ultimate outdoor recreation area, complete with chipping and putting greens, and much more. Greg Frank, LC/DBM A Golfer's Paradise 32 The path that one woman took to become a landscape contractor and architect, and the career that followed, was advanced by the ability to adjust. Mike Dahl, LC/DBM Thriving through Adaptation 36 14 Shopper's Spotlight 39 Marketplace Look for this logo to find the 26 product pictures or advertisements that have never been published anywhere before. World Premiere 26 World Premiere Products & Advertisements: Off the Clock | 62 Preserving Capitol Hill's Green Spaces Hardscapes | 8 Innovative Permeable Pavement Installation 32 24 36 28 Publisher's Letter | What Are You Shopping for? 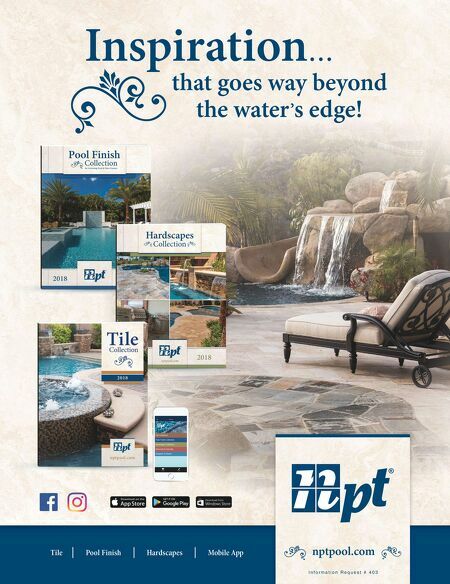 6 vol.21 - no.06 JUNE '18 CONTENTS | CUSTOM RESIDENTIAL/OUTDOOR LIVING Introducing the all new Tools & Equipment Product Search Engine.